MIAMI (25 de enero, del 2019) – Los artistas colombianos Silvestre Dangond y Maluma se unen por primera vez para lanzar un tema que promete convertirse en el éxito del 2019, pues reúne toda la cadencia tradicional del vallenato y el electrizante toque urbano. “Vivir Bailando” es el más reciente lanzamiento de esta dupla de grandes de la música popular del momento, cuyo video se estrena el 25 de enero en todas las plataformas digitales. La canción a su vez saldrá en una versión vallenata. The essence of Colombian flavor and energy, this song promises to become one of the first smashes of 2019! MIAMI (January 25, 2019) – Colombian superstars Silvestre Dangond and Maluma join forces for the first time to release “Vivir Bailando“, which is poised to become the first smash hit of 2019. Available in the original vallenato/urban mix and a more traditional vallenato version, this song goes to retail today at all digital music platforms. “I have loved collaborating with Silvestre on this beautiful song that fuses our styles and has the flavor of our Colombia” shared Maluma. Both artists are at the peak of their powers, delighting the world with their unique and danceable styles. 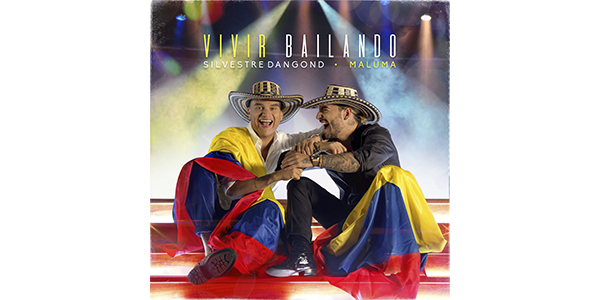 “Vivir Bailando” is co-written by Andrés Castro, Edgar Barrera, Daniel Buitrago and Sharo Torres along with Silvestreand Maluma. Showing off each singer’s respective gift – tropical and urban – this unique track blends their voices and their artistry into a memorable collaboration. The song’s music video, produced in a cinematic format by the team at 36 Grados, tells a moving story of interracial love, and of using music and dance to break down barriers and prejudice. With an ambitious story arc, it follows a couple’s relationship from their childhood days all the way to their golden years. Filming took place on location at a picturesque ranch on the outskirts of Medellín, Colombia, as well as a historic railroad station and a beautiful local church. “Vivir Bailando” is sure to become one of radio’s most-requested songs of the year and will delight fans ofSilvestre Dangond and Maluma, two icons who have helped Colombian popular music conquer the world.